As many of you know, the Linkous family is doing our whole food challenge for the month of May. So far, we’ve done really good. We have used two of our cheat meals as we were out of town over the weekend, but ate 4 of the 6 meals NOT out. I was proud of us! Anyways, when we returned from church Sunday we knew something good was on the meal plan. It is something new but no doubt sounded amazing. 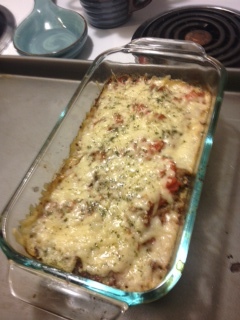 Join me today as I share how we made parmesan meatloaf! I found this recipe from a fellow blogger, Mommy, I’m Hungry! They’re recipe is gluten free but I’ll be honest, I didn’t do gluten free. I used what I had, which is about normal for us. I began by changing the meat to venison. We mainly use venison here because it’s what we have AND we love it! I got a few pounds from my parents and put it in the crock to cook it. I usually cook it on high for a few hours and just watch it. I love that it doesn’t dry out but it doesn’t get greasy. What a win! The next thing I did, once it finished cooking, was add it to my mixer (I love it, too!) along with eggs, breadcrumbs (made from leftover whole wheat bread), dried basil, thyme, oregano, salt, pepper, and freshly grated parmesan cheese. It called for an onion and garlic but I didn’t have it on hand so I improvised with garlic and onion powder. Once I lightly mixed it, I put it into my greased pan and patted it out well. I added some canned tomatoes that mom and I did last year for my marinara sauce. I threw some of the spices on top of that, too. In the oven it went for 45 minutes. After it cooked, I added enough parmesan cheese to layer the top along with some parsley and cooked it for another 10 minutes. The verdict? Oh. My. Word. My momma makes the best meatloaf, hands down, but this is the closest second I’ve ever had. It was so moist and light and the tomato sauce on top was definitely an added bonus. It was definitely easy to fix and put together, which would be perfect for a night when you had a lot to do around the house. The dishes were minimal, too, which I loved. So, go out and get anything you need and make this dish. It will definitely be a regular repeat here! Preheat oven to 350 degrees. Lightly together ground meat, eggs, breadcrumbs, basil, thyme, oregano, garlic powder, onion powder, real salt, black pepper, and ½ parmesan cheese in your mixer (or by hand). Pour mixture into your greased loaf pan and pat well. Pour marinara sauce (or canned tomatoes) on top. Cook in oven for 45-60 minutes (I did 45). Add remaining parmesan cheese and parsley to the top and place back in the oven for 10 minutes. 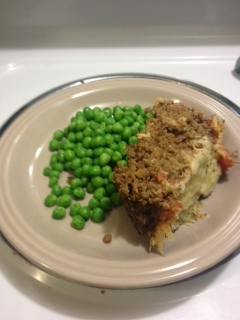 Remove and serve with side (we did peas- yum!). I love when I stumble upon an amazing recipe. Absolutely love it! We went to visit with my friend Stacy about a month ago and she fixed us an AMAZING dinner! 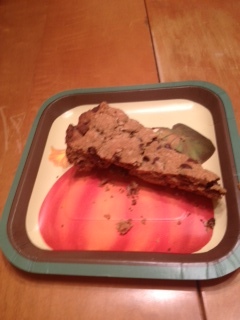 We had Butternut Squash Casserole AND an amazing dessert- Whole Wheat Coconut Chocolate Chip Cookie Cake. Say that twenty times in a row. It’s just not possible. Want to know what is possible? Fixing this dish. It is SO very easy and taste SO very good! She found this recipe from Bran Appetit and I knew I just had to try it, too! I wanted to share it with you today because it is indeed a Manic Monday recipe. Join me! Start out with all your ingredients. They are simple ingredients, too. You will need butter (real butter! 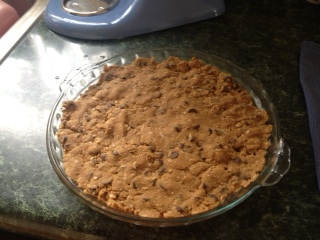 ), sugar, flour, baking powder, baking soda, salt, vanilla extract, eggs, semi-sweet chocolate chips, and shredded coconut. I had everything in stock and didn’t need to buy anything at all. I love those kind of recipes more than anything else. I sat everything out in advance and let my butter soften. That part is important, too! Start out by mixing together your butter and sugar. Once it’s mixed well, add it your vanilla extract and eggs. The last thing you’ll do is add the remaining ingredients: flour, baking powder, baking soda, salt, and then chocolate chips and coconut last. 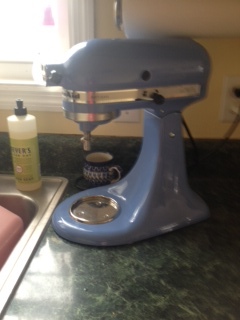 My stand mixer shook a little with all the stuff in their but she did the trick. I love her. I haven’t named her yet, but I do love her. Isn’t she a beauty? Once all this is mixed together, grease your skillet and pat the mixture into it. Or in my case, your glass dish. I don’t have a round skillet but I did have a round glass dish and figured it would do just as good of a job (and it did!). Once you have it layered well, it will go in the oven for 30-40 minutes at 350 degrees. Keep in mind that this will NOT be a wet dish, it’s more dry than wet. It makes it really easy to mold and move around. Once it’s set, it browns nicely and both times, mine only took 30 minutes to make all the way through. It tastes REALLY good warm. Oh so good! It tastes good cold, too, so it’s definitely a dish that can be eaten both ways. I made this for dessert this Easter and my family LOVED it. It was a hit for not only them, but me as well. I was really glad I attempted this dish and we’ll be making it again soon. I would recommend making this when you plan on feeding multiple people or otherwise you’ll be bringing home or keeping a lot of cookie cake. If you want to eat a lot of cookie cake then you’re good. If not, heed my word! 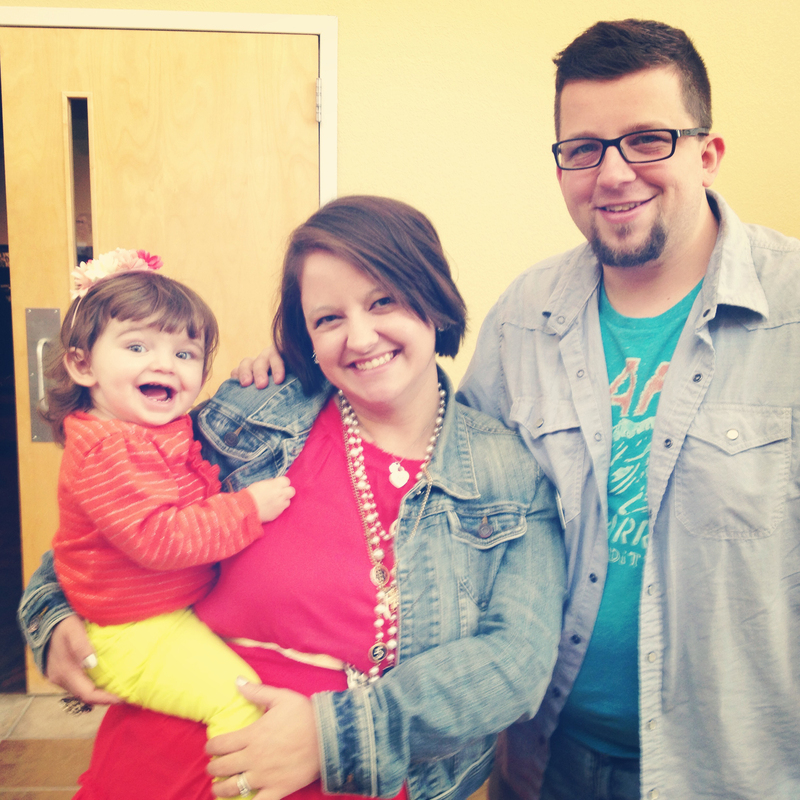 Happy Easter from the Linkous’! I hope you all had a Happy Easter and I look forward seeing you next week for another Manic Monday meal- what to add as toppings to your salad (the post from this week got delayed-oops!). Preheat your oven to 350 degrees. Grease your skillet or dish with butter wrapper. Mix butter and sucanat together until well blended. Add in the vanilla extract and eggs until mixed. Pour in the flour, baking soda, baking powder, and salt and mix again until a doughy-consistency is made. 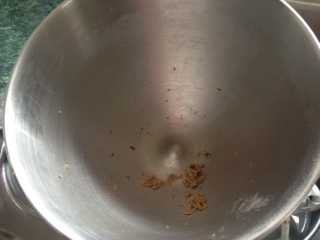 Once it is well mixed (2-3 minutes in a stand mixer), add the chocolate chips & coconut flakes. Put your dough into the skillet or dish and spread into an even layer. Bake for 30-40 minutes until golden brown (I started checking at 30 minutes). Allow 10 minutes to cool prior to serving. Tastes GREAT with ice cream. Yum! Makes 12-16 servings, depending on the size of cookie cut. It’s Manic Monday! Let me start by telling you right now, we are big fans of Cheddars. Due to some recently bad service, I have been on strike, but overall, I do love their food and service (food a little more as of now). One of our favorite things to get there is the bourbon glazed salmon. It melts in your mouth. When I began my hiatus I knew I was in trouble because this dish would be deeply missed by the Linkous household. I knew that we couldn’t go without it for too long so I took matters into my own hands and did what any loving wife would do. I found a recipe on Pinterest. Ah, Pinterest, how I love you. You are addicting but offer so many GREAT things! 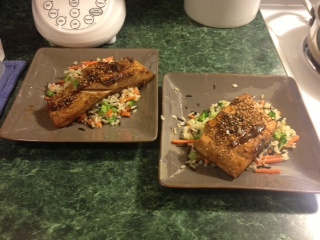 Here is the recipe we used for our Bourbon Glazed Salmon, straight from the table of Cooking Light. Well, maybe not straight from since there a few minor changes. But you get what I’m saying. Let’s check it out! The ingredients. Minus the last 3. Oops. We began this recipe by letting the salmon thaw. If you’ve put it in your freezer, it’s best to let it thaw in cold water in the fridge. It keeps bacteria at bay and bacteria loves nothing more than a piece of fish soaking in hot water in the sink. Yuck. Once it’s thawed good (usually takes about 20-30 minutes), you will get to place it in a bag full of wonderful goodness. I’m not even joking about this. It seriously is wonderful. You’re going to make a mix of sucanat, bourbon, soy sauce, ginger, lime juice, garlic cloves (minced), and black pepper to put in the bag with the salmon. Let it marinade for several hours but at least 1 ½ hours. 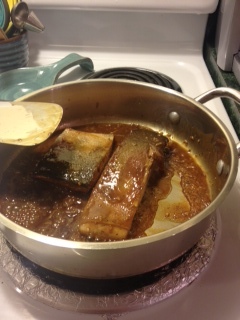 Once it’s finished marinating, heat a skillet medium heat and coat the pan with cooking spray or butter. Add the fish and all the marinade to the pan and cook for about 4-6 minutes on each side. When it begins to flake, you’re done! Put one salmon fillet on each place and put a small amount of the remaining sauce on top of it. Sprinkle with green onions and sesame seeds if desired. We choose to eat ours with some yummy salad and brown rice. There’s an endless amount of things that taste good with salmon so have your pick! We hope you enjoy this meal as much as we did. It tasted great and saved us a lot of money when compared to eating it out. It is definitely something we will make again! 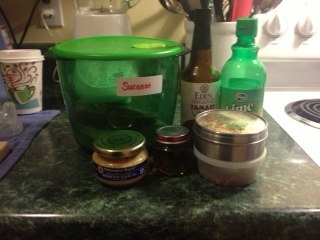 Join us next week for Manic Monday as I share a yummy Homemade Honey Mustard recipe! Mix first 7 ingredients in a bag and shake. Shake, shake, shake. Add your salmon and stick in the fridge to marinate for at least 1 ½ hours. After this time has passed, heat stove top to medium heat, spray with cooking spray or add butter, and add fish and marinade. After cooking for 4-6 minutes on each side the fish should become flakey. Put on a plate and add a small amount of the sauce on top. Add green onions and sesame seeds if desired. Serve alongside rice and broccoli. Soooo good! Something I’ve learned over time is this: it’s a lot cheaper to MAKE your own stuff versus buying it made. Is that clear as mud? Here’s what I’m saying. When you buy something in it’s original state and then take the time to make it into what you want, most times you will save money. For example, we make our own kefir and it’s a lot cheaper. 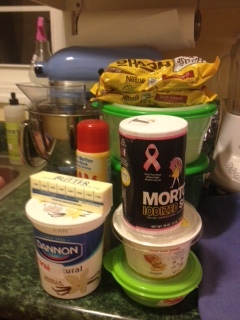 We also try to make our own yogurt from time to time, which is cheaper, too. Another thing we’ve found to be true is with seeds and nuts being toasted. Join me today! JR really likes raw nuts, especially almonds. I am learning to love them. 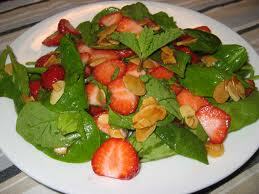 I’m trying to add them into our diet more and more and one way I’ve found that I really like is with salads. The recipe I have been using calls for toasted almonds and I’m not going to lie- I was NOT going to buy them after I bought two bags of raw almonds. 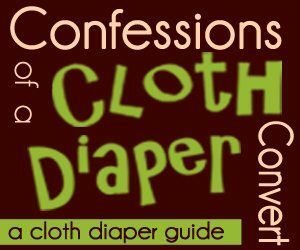 I went searching for ideas and found that I can make my own and their super easy. Who knew? This girl knows now.You can use this method for not only nuts, but seeds, and here’s how! Put some your item on the stovetop. I usually do a lot (or as many will fit comfortably) so I will have them already toasted and ready for later. Cook stoves on medium heat and stir occasionally until golden/light brown. Keep in mind that you can overcook them so don’t allow them to cook for too long. You can store nuts in your pantry (if you plan on using them quickly) or in your freezer for a few months. For seeds, you can store them out for a good amount of time before they go bad. We have used this recipe several times and they’ve turned out great both times. Another thing we really like is how you don’t have to use any oils to cook these. Almonds produce their own oils to keep them from sticking. That rocks! 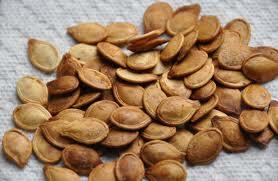 As far as the seeds go, we usually use seeds for pumpkin seeds as they tend to dry out easier. 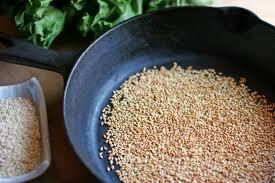 With the sesame seeds, we didn’t use any oil and they cooked well, however, I did let them overcook. The good news is, they still tasted good, even after being cooked for too long. That was the biggest win of all! I hope you enjoy buying your raw foods and being able to save even more! It’s a blessing to know that you can save money by being willing to spend another 5-10 minutes tops. What a win! What do you like to toast? When JR and I first got married, we had a few meals that were staple items. One was burgers with onion rings. We ate those A LOT. And gained A LOT of weight in the process. Shew, the things I would go back and tell myself…Anyways, today I want to share with you another meal we made that has luckily stood the test of time. 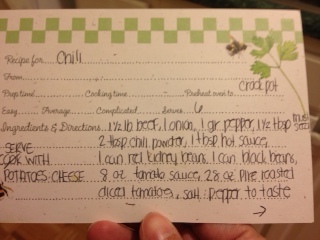 With some changes here and there along the way, we came up with our own version of chili and we absolutely love it! I hope you love it, too. Also, jalapeno cornbread tastes amazing with it. Just saying. The first thing you’re going to need to do for this menu is cooking your ground meat. 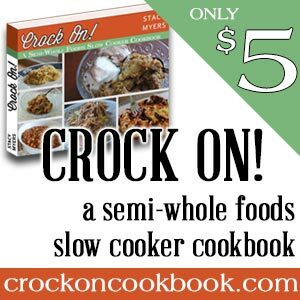 We always cook ours in the crockpot on low for several hours and then store it in the freezer. It helps us prepare meals better and make less of a mess along the way. So, in our case we pull a pound of ground meat from the freezer and let it thaw until ready. 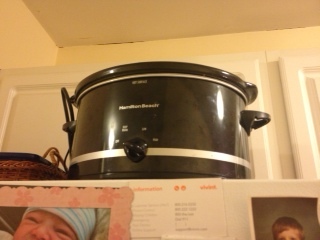 The next thing we do it the obvious- we throw it in the crockpot. So easy! The next step is to throw in an onion and a green pepper. If you’re making your meat on the stove, you can throw in your diced vegetables but if not, just dice them and throw them straight in the crock. The next step is to add all the beans. You can’t make chili without it. 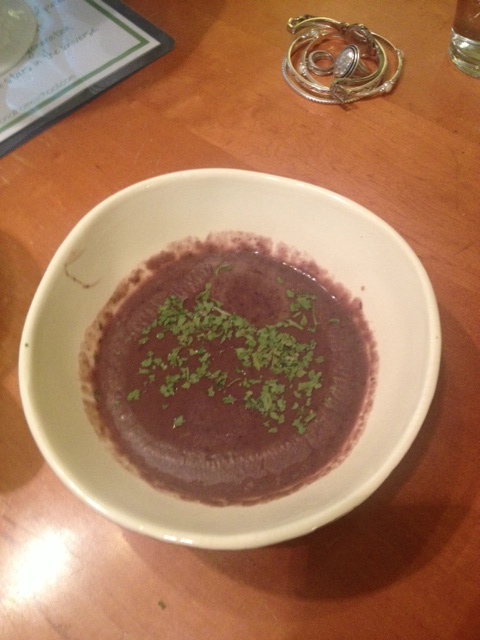 We use all kinds of beans but what we use most often is one can of red kidney beans and one can of black beans. Most recipes will tell you drain them but I feel like it becomes too dry so I go ahead and put the beans and juice in all-together. If you’re doing dry beans that you’ve soaked and cooked (cooks well in the crockpot, too), you can add a little extra water with it. Next step is to add a can (8 ounces) of tomato sauce and a can (28 ounces) of diced tomatoes. The truth here is I have added a few different sizes from time to time and they’ve turned out fine. That’s one thing I really love about this recipe. I’ve yet to mess it up and that’s a total win for me! The last step is to add those yummy spices- 2 tablespoons of chili powder, 1 tablespoon of hot sauce, 1 ½ tablespoons of ground mustard seed and salt and pepper to taste (I like 1 teaspoon of both). This part is where it gets easy. 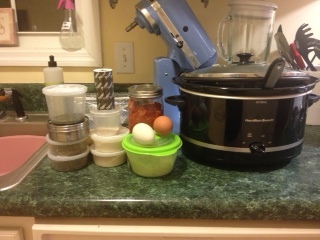 Take everything you’ve just put in the crockpot, mix it up, set it on low for six to eight hours, and wait. That’s all. I love easy and this makes it SUPER easy. Nothing beats this on a cold winter’s day. I like to make it for others (when they have a baby, when they’re sick, when they just want food cooked for them) and like to deliver it in mason jars. It just seems so “at home”. I hope this makes some of your meals just a little easier and your Mondays a little less hectic. Join us back next Monday for the next Manic Monday special! Brown meat, drain, return to pan, and mix in diced green peppers and onions. Once finished, add to crockpot with all spices, beans (preferably undrained), tomato sauce, diced tomatoes, salt, and pepper. 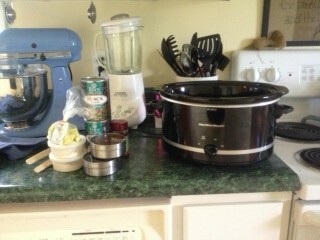 Cook in crockpot on low for 6-8 hours. Serve alongside cornbread or potatoes. Yum!